The eastern half of the United States is dotted with thousands of huge earthworks built long ago. Many are in the shape of animals or humans. Archaeologists are learning more about the people who built them, but much of the symbolism and ritual function of these extraordinary earthworks remains a mystery. It was a clear, crisp day in the autumn of 1976. 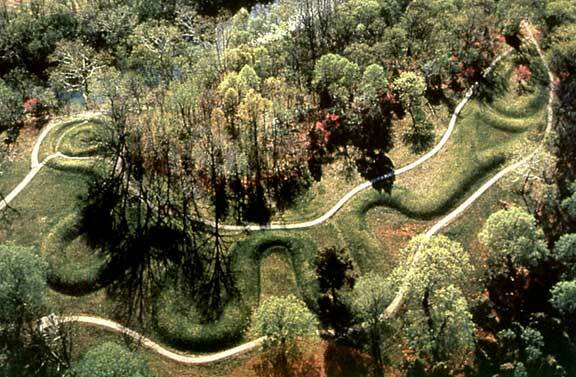 American sociology professor Robert Harner stood atop the mysterious Serpent Mound (above) in Adams County, Ohio, and looked out along the length of the 1,348-foot-long coiled earthwork. As he did so, he was suddenly shaken by "the coldest, most abject terror I have ever experienced." Feeling an evil force moving toward him. Prof. Harner saw it outlined in a pattern of swirling leaves. As the leaves moved closer, Harner was so horrified by the sight that he nearly fainted. Suddenly, as quickly as it had arrived, the "force" disappeared. The leaves fell to the ground and lay still. Harner hurried back to his car and promised himself that he would never return to the huge 2,500-year-old effigy mound. Later, writing about his eerie experience in Fate magazine (June 1977), he concluded: "Perhaps they built their mound on that particular hill because very special things happen there. "Origins of the Mounds. The huge Serpent Mound that so terrified Harner is just one of the thousands of curious earthworks that are dotted throughout the eastern half of the United States. They include earthworks, called effigy mounds, fashioned in the shapes of various animals, humans and other figures. At several sites, a row of such effigies can be found, forming hilltop processions of panthers, bears, lizards, turtles or giant birds. Far from being the product of a single, uniform culture, the mounds and earthworks were apparently created at various times – from as long ago as 500 B.C. to as recently as A.D. 1500 – by several societies. Were the mounds ancient places of worship or celebration? Or were they something much more mysterious? Archaeologists are still searching for the key that will help them unlock the mystery of these puzzling remnants from a vanished past. Prehistoric American Indians traditionally buried their dead with the objects they valued most. Examination of the many thousands of artifacts that have been discovered within the earthworks has provided a partial picture of the people who built them. After years of classifying their finds, most archaeologists now agree that despite the sophistication of the monuments they left behind, the mound-building cultures were no more advanced than any other tribes of their times. These were the Adena, the Hopewell and the Mississippian Indians. Scholars and archaeologists have been trying to solve the mystery of who built the great burial mountains of North America since the 1800s. The best clues may lie hidden within the mounds themselves. In the 1930s, the burial mound known as Craig Mound in the huge Mississippian center of Spiro in eastern Oklahoma was practically hollowed out by looters. They escaped with copper breastplates and masks, magnificently engraved shell cups, ornate stone figures and wooden mortuary carvings. The haul was one of such unparalleled richness that newspaper stories describing the theft referred to the 1,000-year-old burial mound as "King Tut's Tomb." Archaeologists attempting to salvage what remained of the Spiro site found a great mortuary for the elite. Many of the burial mounds were heaped with personal possessions and gifts, providing clues to the wealth and status of the Mississippian culture. Secrets of the Dead. The Spiro site was not the only one found to contain such artifacts. Most of the mounds that have been excavated by archaeologists have revealed an amazing array of tools, weapons, jewelry and ornaments accompanying the bones of the dead. Not only have these articles helped to identify the different mound-building cultures, but they are often the only clues researchers have to the social, economic and religious practices of these people. Many of these figures could only be fully appreciated from the air, suggesting, some claim, that the Hopewell Indians may have practiced levitation or experienced out-of-body sensations. The effigy mounds, especially those depicting winged creatures, were thought to be symbols of this magical flight." Beneath many of the earthen burial mounds, the 19th-century researchers E. G. Squier and E. H. Davis found enormous, well-built structures, which were used not only for housing the bodies of the dead, but for all the complex preparations of burial. Ancient American Indians thought communication with the spirit world was possible through dreams, trances and symbolic transformations into sacred animals, all of which were believed to be important aspects of shamanism. A large number of Hopewell burial mounds have yielded animal skin costumes and masks, suggesting, some claim, a strong link with shamanic spiritual transformations. Throughout the 4th and 5th centuries, the Hopewell culture began to decline and Indian burial practices eventually became much simpler. The reasons for these changes are not understood. In the centuries following the decline of the Hopewell culture, social priorities began to change and around the start of the 9th century, the last of the mound builders, the Mississippians, began to emerge. By A.D. 1500, the culture had spread west and southeast from the central Mississippi Valley as far as Texas and Florida. Unlike the Adena and Hopewell, the Mississippians appear to have built many of their mounds for purposes other than burial. In many towns and villages, they built high palisades and flat-topped rectangular earthworks that served as bases for temples, meeting houses and other important buildings. The Mississippians buried most of their dead in graveyards, yet the earlier burial mounds did not entirely disappear. In larger burial sites, the Mississippian elite were interred in special burial mounds with elaborate gifts reflecting their status. Excavation of some of the mounds has revealed numerous skeletons and a variety of grave goods. The Cahokia Mounds. One of the first, and largest, ancient Mississippian settlements, Cahokia (located near what is now St. Louis, Missouri), contained 100 or more mounds and (including its outskirts), covered 125 square miles. By some estimates, it was home to as many as 40,000 people. Its centerpiece, Monks Mound, is the largest prehistoric earthen construction in the world. 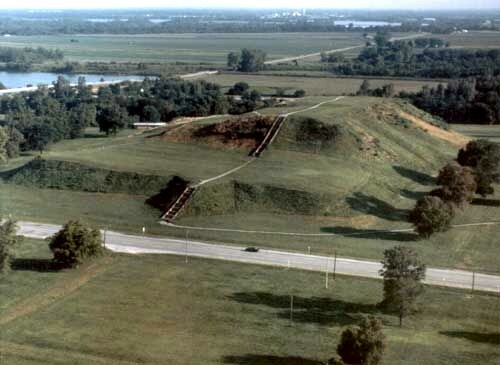 Research suggests that many of the mounds in Cahokia are oriented to the cardinal directions and may have been used, in conjunction with posts set in the ground, to mark astronomical events. The Decline of the Mound Builders. 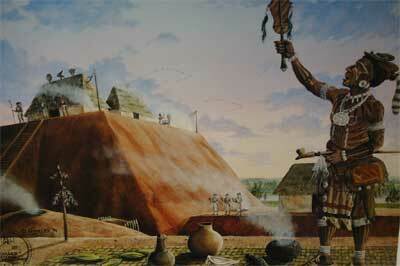 By the early 15th century, the great Mississippian settlements had begun to decline. The people who had built the mounds did not disappear, but their societies broke down and they returned to a simpler way of life. Who Were the Mound Builders? The first American mounds were discovered by the explorers and settlers who began to spread out across America in the late 1700s and early 1800s. Most authorities were baffled by the mounds. Their apparent antiquity, the incredible planning that must have gone into their construction and the lack of local knowledge on the subject, led to fanciful speculations about the identity of their builders. Some believed they were built by the 10 Lost Tribes of Israel, the Vikings, or even the Atlanteans. Others claimed they were constructed by a long-vanished superior race. One such pundit, the 19th-century investigator Galeb Atwater, noted the mounds "owe their origin to a people far more civilized than our Indians." The President's Proof. Others had less fanciful ideas. Even in the 1700s, some claimed the builders were American Indians. Among these was the third president of the United States, Thomas Jefferson. Around 1780, Jefferson excavated one of the mounds near his home in central Virginia and estimated it contained more than 1,000 American Indian skeletons. An amazing and informative discussion, Rak. Only just reading this now, but first of all what fabulous images, All quite stunning. Most interesting, and also the time-span involved is quite something.